Always Secure Your Dog: Small dogs allowed to ride loose in cars can get caught beneath the pedals, or seats, or bounce from seat to seat obstructing vision and pulling your focus. They've also been known to jump from open windows. 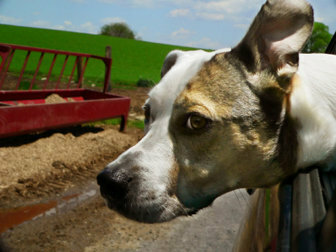 Larger dogs can be injured by flying road debris if their heads are out the window, and can also get in the way. ALL dogs can fall out of a moving car if the window is open wide enough. We know Rover wants to see what's going on, which is why she needs to be secured in the car. For small dogs, there are special pet beds that elevate them to the window's level, while still keeping them attached to the car, much like baby seats, and for larger dogs there are harnesses designed to work with seatbelts. Ride Inside or Not At All: It may seem natural to load a dog into the back of a pickup truck for a ride, but think before you do it, and then - don't. Even a dog that has never chased squirrels before may decide to leap at one from the back of the truck, and a sudden stop or too-fast curve could toss the dog out of the truck as well. If you must bring your dog along, let him ride in the cab. Open the Window - But Not All the Way: You do want your dog to enjoy his or her car ride, so do open the window so they have fresh air to sniff, but only a little bit - an inch or so - so that they cannot jump or fall out. This also prevents people from sticking their fingers in your dog's face when you're stopped. When You Park: Never leave your dog alone in a parked car - just as you would never leave a small child alone. If you do need to leave the car for a few minutes, be sure the windows are cracked open and the doors are locked. If you're on a long trip, and stop for a meal break, be sure to let your dog out of the car as well. Many highway rest areas have special sections for dog walking, so heed those signs, and always offer your dog water at the beginning of a rest break, so they have time to eliminate before you get back on the road. Also, be sure that your dog is on-leash at all times, even if they're impeccably trained. You don't want the one time they don't come to be when you're miles from home. Traveling with your canine companion can be fun, and if you keep your dog secure, you'll be able to do so without the stress of worrying about their position in relation to your feet, hands, or eyes, and without them turning into a projectile if you stop short. Remember, pet auto insurance is not a liability insurance policy and doesn't cover the damage you caused to someone else's car because Fido was sitting in your lap when you accelerated. I am with you on that one. There are occasions where the dog just goes on your lap by itself, but those times where the owner puts it on their lap intentionally make me cringe when I am driving. Turning is harder, they can lick you in the face and make you swerve, or even jump out the window, in which case all dog owners would slam on the breaks to get their pooch (you see the bad in that one lol). Compared to drunk driving, they have to be close with the property damage and lives. Personally i would rather be driving drunk then with a squirming dog on my lap (never driven drunk before and don't plan on it lol). My late dog always rode in the back of my hatchback. I would have liked to put a barrier there so that in case of an accident, he would not have been thrown forward, but I was never able to find an appropriate barrier even though I looked for one. Its good that insurance companies come forward to cover for pets also. I ones got into an accident where my dog caught into the brake pedal and i couldnt stop for a turn and crashed into the sign boards. I've seen people ride with a dog in the front seat. When I lived in San Diego, I had a neighbor who had a car with right hand drive. He had a very big dog that would sit on the passenger seat making it look as though the dog was driving. It is unwise to let a dog ride on the front seat. A dog that will not stay in back should be restrained in some manner so that it cannot get onto the front seat. Here is a video of a dog driving. It's a joke, but the people think it's real. They could do it with a chimpanzee; they are capable of driving a car and can learn to stop at red lights and stop signs. They might even drive better than some people! There are some types of cargo nets that block off the back of the car which might come in handy. Thank you for providing as here some important reminders about driving with pets like dogs. I know sometimes pets are a distraction, and that puts both motorist and their passengers at risk so now I'm gonna be careful. Welcome to Fasd john. One can never be too careful when it comes to driving! Nice to meet you. It's much rather more fun to walk to the park with your trusty dog than to drive with them. As you have stated, they can be a driving hazard. I wouldn't feel safe with an animal inside my car.